Posted on 12 July 2011. While the west averts its eyes, Bahrain’s people are subjected to brutal suppression. It hasn’t been. Syria was subjected to sanctions and Libya to air strikes; Bahrain, however, was rewarded with visits from the Pentagon’s two most senior officials – the chairman of the joint chiefs of staff, Mike Mullen, andthe then defence secretary, Robert Gates. Disgracefully, at the same time as peaceful protesters were being rounded up and imprisoned, both men offered full-throated endorsements of King Hamad Bin Isa al-Khalifa‘s brutal regime. The Sunni Khalifas have ruled Shia-majority Bahrain – officially a constitutional monarchy – since 1783. Bahrain’s prime minister since 1971, Prince Khalifa bin Salman al-Khalifa – the king’s uncle – has the dubious distinction of being the longest-serving unelected prime minister in the world. Unemployment stands at 15% – the highest in the Gulf – and Shias have long complained of discrimination and disenfranchisement. The Arab spring reached Bahrain on Valentine’s Day; protesters – both Sunni and Shia – arrived in Manama’s Pearl Square on 14 February to demand political freedoms, democratic reforms and greater equality for the Shia majority. They were met with rubber bullets and teargas; three days later security forces switched to live ammunition. Within a few weeks some 2,000 Sunni soldiers from Saudi Arabia and the United Arab Emirates had arrived in Bahrain, at the invitation of the Khalifas, to impose martial law – and, in doing so, poured oil on the fire of sectarian tensions. Since February at least 30 protesters have been killed and more than 500 people detained, four of whom died in suspicious circumstances. Meanwhile, up to 2,000 people across the country have been dismissed or suspended from work – almost all of them Shia. According to an investigation by al-Jazeera, 28 Shia mosques and religious institutionshave been destroyed by the authorities. Few have been spared the wrath of the Khalifas. Last week friends and relatives of the Bahraini football stars A’ala Hubail and his brother Mohammed claim they were beaten and threatened in custody after being arrested in March for their participation in the protests. “You are British: imagine David Beckham gets arrested and tortured. It’s unthinkable,” a friend of Hubail told the Times. The Orwellian regime in Manama continues to round up people for the most minor of “offences”. Last month, for example, the 20-year-old university student Ayat al-Qarmezi was arrested, assaulted and sentenced to a year in prison – by a military court – for reading out a poem criticising the king at a rally. Yet western leaders and journalists continue to callously avert their eyes. Those who itched to drop bombs on Libya have little to say about Bahrain – Misrata, yes; Manama, no. Bahrain is “complicated”, say our leaders. It isn’t. A king has turned his security forces on his own subjects. And the reason the US hasn’t come out against him is as cynical as it is simple: Sunni-led Bahrain is a strategic ally of the US, a counterweight to Shia-led Iran, and home to the US navy’s fifth fleet. Syria isn’t. Neither is Libya. Since September 2001 Bahrain has been a key Middle East collaborator in America’s so-called war on terror; in 2002 it was designated a major non-Nato ally by George Bush. And, on a visit to Manama last December – two months before the Khalifas began killing their people – Hillary Clinton, the US secretary of state, called Bahrain a “model partner” and said she was “very impressed by the progress that Bahrain is making on all fronts – economically, politically, socially”. 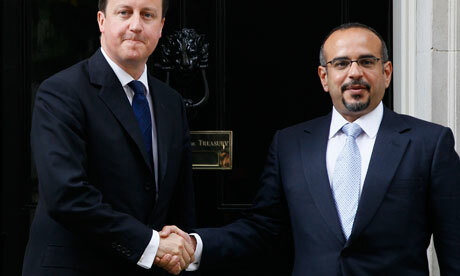 Meanwhile, our queen invited King Hamad to the royal wedding in April, and our prime minister, David Cameron, welcomed Crown Prince Sheikh Salman bin Hamad bin Isa al-Khalifa to London in May, greeting him on the doorstep of No 10 with a firm handshake and bringing a whole new meaning to the phrase “blood on our hands”. The blood, however, is on all our hands. Successive British governments have supplied the Khalifas with submachineguns, sniper rifles, smoke canisters, stun grenades, tear gas and riot shields. These have been deployed, with murderous effect, against unarmed civilians in Pearl Square and Shia villages across Bahrain. It is bad enough that we helped arm and equip the brutes of Bahrain and then turned a blind eye to their violence and torture; we must not now allow our leaders to endorse this farcical “national dialogue” or further patronise the country’s bloodied and battered opposition. Bahrainis need democracy, not doughnuts. Somali refugees need your help now! Tens of thousands have fled their homes, walked for weeks in search of food. Many young children have died along the way. And all of the Somali refugees arriving in Kenya and Ethiopia are exhausted. Between 40 per cent and 50 per cent of the children are acutely malnourished. Please give whatever you can afford. You will save lives; give protection. And you will offer hope to people who are in an extremely desperate situation. £ 30: therapeutic feeding kits – each one helps feed five children. £ 50: survival kits – each has a blanket, mattress, kitchen set, stove and soap. £ 100: all-weather tent to shelter a refugee family. £ 200: nutrition survey kit, includes weighing scales (x5), height measuring board, haemocue machine and accessories (microcuvettes, lancet, etc. ), and mid upper arm circumference ape. Thank you so much for whatever you decide to give. Posted in CampaignsComments Off on Somali refugees need your help now! The newspaper conglomerate is not only behind smear campaigns against the Palestinian cause, it supports corruption. Hacking the mobile phones of British families who had lost loved ones to sexually depraved violent criminals, al-Qaeda inspired “terrorists” and Taliban insurgents proved the tipping point that led to the closure of Britain’s most popular Sunday newspaper The News of the World, first published in London in 1843 and printed for the very last time on Sunday July 9, 2011. To adopt a current media idiom, hacking these telephones at times of deep family grief became toxic for Rupert Murdoch’s News International media empire because public support for precisely these victims sits at the heart of all Murdoch’s political strategies. As a result, Murdoch has been forced to mount a damage limitation exercise on an unprecedented scale in an effort to protect his global media empire from the fallout. Hugh Grant, a famous British actor turned investigative journalist, himself a victim of News International phone hacking was the first to acknowledge the extent to which the invasion of celebrities and politicians’ privacy paled into insignificance compared to the unpardonable intrusion into the lives of the newly bereaved. Grant is absolutely right, but it is the fact that Sunday’s News of the World – like its daily sister The Sun – sets itself up as the champion of these victims that hoisted it by its own petard. In fact, the “Sarah’s Law” campaign that named and shamed convicted paedophiles following the murder of eight-year-old Sarah Payne was spearheaded personally by Murdoch’s now beleaguered lieutenant Rebekah Brooks. When confronted with criticism that the campaign encouraged vigilantism and threatened the rule of law she responded that she did not “regret the campaign for one minute”. The same well attuned ear for the popular mood led The News of the World and The Sun to launch and promote the popular charity Help the Heroes that supports British troops. Safe in the knowledge that Murdoch’s News International phone hacking scandal will now be subject to forensic examination and extensive analysis, I will delve instead into the News of the World toolbox of dirty tricks to see what dark arts of the modern hacks’ trade have been deployed against supporters of the Palestinian cause in recent years. In doing so I believe I will get closer to the heart of Murdoch politics – an important topic that will almost certainly remain untouched by any official inquiry into the criminality and immorality that has dramatically engulfed his media business in Britain. I believe it is especially enlightening to reflect on the damage done to the reputation of Palestinian supporters by News International journalists in a week when David Cameron has been seriously compromised by his close association with the disgraced former editor of the News of the World, Andy Coulson, yet has come under no pressure in parliament for keeping the prominent Palestinian peacemaker Sheikh Raed Salah in prison for no good cause. Moreover, it is no coincidence that the handful of British politicians who might once have voiced their concern over Sheikh Salah’s ill-conceived arrest have been silent in the face of the ongoing power of uncritical pro-Israel politics nurtured by Murdoch’s journalists over a long period. As Samira Quraishy observes in an article for Middle East Monitor, this silence has been most conspicuous in the case of leading Liberal Democrats including party leader Nick Clegg, Sarah Teather, Ed Davey and Simon Hughes. Take the case of Sarah Teather – before she became a junior minister to the Murdoch-friendly neo-con cabinet hawk Michael Gove, she was an outspoken supporter of the Palestinians. Not only is her present silence on Sheikh Salah’s plight a tribute to Murdoch’s unbroken grip on government security policy, it is also a slap in the face for the many voters who put a tick in the box next to her name at the last general election in the mistaken belief that she would show consistency of conduct in or out of government. True to form, The Sunadopted a tried and tested smear tactic by juxtaposing moral outrage aimed at Salah – an alleged “hate preacher” – entering Britain unchallenged with an unconnected story about Britain being hindered from deporting “hundreds of foreign killers, paedos and rapists” by a ruling of the European Court of Human Rights. This follows the same successful formula adopted against a wide range of Palestinians and Palestinian supporters, especially Muslims, such as the academic Tariq Ramadan and Sheikh Yusef al Qaradawi. Whether low brow tabloids or their upmarket counterparts in the UK, US and Australia, all Murdoch newspapers have a consistent policy of targeting and denigrating active supporters of the Palestinian cause whenever and wherever they can. “Extremist Islamic scholar Tariq Ramadan, who backs suicide bombings, is to address a London conference part-funded by police”. “…in our bomb-hit capital he is being given a platform to speak – while the victims of Britain’s worst terror atrocity wait to be buried”. “The police must pull the plug without delay. And Home Secretary Charles Clarke must move swiftly to ban Professor Ramadan from our shores”. In addition to the targeting of specific “extremists” such as Ramadan, Murdoch’s tabloids regularly stigmatise Muslim communities in Britain. According to research published last week on the sixth anniversary of the London bombings, the News of the World and The Sun have contributed to the creation of “suspect communities” through reporting that fails to distinguish between terrorists and the communities in which they live. According to The Guardian’s exemplary ongoing investigation, phone hacking and police bribery appear to have been relatively cheap and frequently used tools to elicit information for news stories of all kinds, whether political in nature or not. Interestingly, however, when The News of the World wanted to exert maximum pressure on its chosen targets, it would resort to a more invasive and pro-active tactic – the deployment of undercover investigators, most notably the notorious Fake Sheik, Mazheer Mahmood, in what are often described as “sting” operations. Doubtless Mahmood’s book Confessions of a Fake Sheik, published in 2008 by Harper Collins, is the least reliable kind of evidence – but it does at least provide some compelling if unwitting testimony about the political motivation and machinations behind his undercover deployment against two notable Palestinian supporters in the UK, former Labour Party and Respect Party MP George Galloway and Mohamed Ali, CEO of Islam Channel TV in London. Mahmood ruefully admits failure in his sting operations against both Galloway and Ali. Characteristically, when he became fully appraised of the News of the World sting operation, Galloway exposed Mahmood in parliament as an “agent provocateur”. Subsequently, it came as no surprise when Galloway joined the long list of phone hacking targets being offered large sums of money by News International in an attempt to silence them – an unlikely ambition in Galloway’s case. What Murdoch’s tabloids sought to obscure was the reality on the ground. Their portrait of Galloway as an appeaser of terrorists was shown to be well wide of the mark in London, where he was twice attacked by al-Qaeda cheerleaders for successfully persuading young Muslims to channel their anger against British foreign policy in the Middle East into democratic politics. Not a story that fit with Murdoch’s agenda. Most telling, is the credence that Murdoch journalists gave to corrupt dictators – such as Ben Ali in Tunisia and Mubarak in Egypt – happily now deposed and discredited. Indications of Murdoch’s personal interest in discrediting Mohamed Ali became apparent when considering the role of journalist Richard Kerbaj, who was transferred by Murdoch from The Australian to The Times in London – not least because of his contacts with corrupt security regimes in North Africa and the Middle East. Suffice to say, Kerbaj supplemented Mahmood’s dirty work on behalf of The News of the World with his own supposedly authoritative reporting for TheTimes. Much the same kind of synergy can be seen between Dean Godson’s eloquent or “anti-Islamist” commentaries in The Times and Richard Littlejohn’s belligerent versions of the same message the columns he wrote for The Sun. In Ali’s case, Mahmood was clearly briefed that his intended victim was a former “terrorist”, ultimately on the discredited word of a corrupt dictator. Had the Fake Sheik succeeded in his sting against Ali, News of the Worldreaders would doubtless have been treated to an account of Ali’s “terrorism” that echoes Kerbaj’s version – and is now wholly discredited. The West talks about the human rights abuses and democratisation of the Middle East, and yet turned a blind eye to the repressive anti democratic methods used by Ben Ali [in Tunisa]. Western leaders supported him, believing him to be a staunch ally in the war on terrorism and against Islamist extremism. In the circumstances, Ali, who as a young man was tortured by Ben Ali’s regime, might have directed his words to Murdoch as well as to Western leaders. On a lighter note, and again unwittingly, Mahmood’s book reveals weaknesses in his tradecraft that might suggest he will now be seeking more conventional employment. More seriously, it was a similar failure of tradecraft by the corrupt investigator Glenn Mulcaire, employed by the News of the World, that led him to delete voicemail messages on a mobile phone belonging to murdered teenager Milly Dowler, and thereby leave an audit trail that would provide the trigger for the worst week in the history of Murdoch’s global media empire. It is therefore noteworthy that setting up elaborate sting operations against supporters of the Palestinians, such as Galloway and Ali, would not cause Rupert Murdoch to lose a minute’s sleep – even today. To the contrary, it remains central to the political journalism he has nurtured. 15 year-old resident of Jabalya R.C., North Gaza district, died on 21.01.2011 in Beit Lahiya, North Gaza district, following a delay in receiving medical care. 20 year-old resident of Gaza city, died on 01.01.2011 in Gaza city, following a delay in receiving medical care. 24 year-old resident of Gaza city, died on 22.11.2010 in Gaza city, following a delay in receiving medical care. 64 year-old resident of a-Zahraa, Gaza district, died on 14.11.2010 in a-Zahraa, Gaza district, following a delay in receiving medical care. 2 year-old resident of Gaza city, died on 16.10.2010 in Gaza city, following a delay in receiving medical care. Under 1 year-old resident of Gaza city, died on 05.03.2010 in Gaza city, following a delay in receiving medical care. 2 year-old resident of Gaza city, died on 07.01.2010 in Gaza city, following a delay in receiving medical care. 19 year-old resident of al-Maghazi R.C., Deir al-Balah district, died on 01.10.2009 in al-Maghazi R.C., Deir al-Balah district, following a delay in receiving medical care. 53 year-old resident of Jabalya R.C., North Gaza district, died on 01.12.2008 in Jabalya R.C., North Gaza district, following a delay in receiving medical care. 16 year-old resident of Gaza city, died on 11.11.2008 in Gaza city, following a delay in receiving medical care. 28 year-old resident of Gaza city, died on 07.11.2008 in Beit Hanun, North Gaza district, following a delay in receiving medical care. 39 year-old resident of Khan Yunis, died on 17.10.2008 in Khan Yunis, following a delay in receiving medical care. 1 year-old resident of Rafah, died on 21.09.2008 in Rafah, following a delay in receiving medical care. Under 1 year-old resident of Nablus, died on 05.09.2008 at the checkpoint in the area of Huwara, Nablus district, following a delay in receiving medical care. Additional information: The baby was stillborn following a delay of more than forty minutes at a checkpoint. 36 year-old resident of Rafah, died on 09.07.2008 in Rafah, following a delay in receiving medical care. 68 year-old resident of Deir al-Balah, died on 11.05.2008 in Deir al-Balah, following a delay in receiving medical care. 62 year-old resident of Gaza city, died on 03.05.2008 in Gaza city, following a delay in receiving medical care. 66 year-old resident of Deir al-Ghusun, Tulkarm district, died on 14.02.2008 at the checkpoint in the area of Deir al-Ghusun, Tulkarm district, following a delay in receiving medical care. Additional information: Suffered a heart attack and died after soldiers at al-Jarushiya checkpoint did not permit her evcauation to hospital in Tulkarm. 45 year-old resident of Gaza city, died on 22.01.2008 in Gaza city, following a delay in receiving medical care. 44 year-old resident of Gaza city, died on 21.01.2008 in Gaza city, following a delay in receiving medical care. Additional information: She was ill with spleen and liver problems. Israeli officials delayed her entry into Israel for five days after her scheduled appointment. On the day she was allowed to enter, officials delayed her passage through Erez Crossing for a few hours, and she arrived in serious condition at Ichilov Hospital, where she died a week later. 9 year-old resident of a-Nuseirat Camp, Deir al-Balah district, died on 15.01.2008 in Gaza city, following a delay in receiving medical care. 54 year-old resident of Gaza city, died on 12.01.2008 in Gaza city, following a delay in receiving medical care. 1 year-old resident of Beit Lahiya, North Gaza district, died on 07.12.2007 in Beit Lahiya, North Gaza district, following a delay in receiving medical care. 37 year-old resident of a-Nuseirat Camp, Deir al-Balah district, died on 24.11.2007 in Gaza city, following a delay in receiving medical care. 57 year-old resident of a-Nuseirat Camp, Deir al-Balah district, died on 20.11.2007 in Gaza city, following a delay in receiving medical care. 8 year-old resident of Gaza city, died on 19.11.2007 in Gaza city, following a delay in receiving medical care. Additional information: suffered from meningitis, and died after being refused, for more than a week, entry into Israel. 31 year-old resident of Gaza city, died on 10.11.2007 in Gaza city, following a delay in receiving medical care. 26 year-old resident of Khan Yunis R.C., died on 05.11.2007 in Gaza city, following a delay in receiving medical care. 23 year-old resident of Rafah, died on 28.10.2007 in Erez (Industrial Zone), North Gaza district, following a delay in receiving medical care. Additional information: Cancer patient dies after being delayed entry into Israel for 10 days even though he had a permit to pass. 75 year-old resident of Gaza city, died on 23.10.2007 at the checkpoint in the area of Erez (Industrial Zone), North Gaza district, following a delay in receiving medical care. Additional information: He arrrived at the Erez checkpoint after having received a permit to enter Israel, but soldiers fired at the ambulance and ordered it to return to the hospital in Gaza. The following day, he returned to the checkpoint and was allowed to pass after waiting for more than two hours, but died when he got to the Israeli side. 34 year-old resident of Nur Shams, Tulkarm district, died on 15.09.2007 at the checkpoint in the area of Kh. Jubara, Tulkarm district, following a delay in receiving medical care. Additional information: Cancer patient on his way to hospital in East Jerusalem. He was delayed by soldiers at a checkpoint for more than an hour, even though he and the persons with him had permits to enter Israel. 75 year-old resident of Barta’a a-Sharqiya, Jenin district, died on 06.08.2007 at the Separation Barrier gate in the area of Barta’a a-Sharqiya, Jenin district, following a delay in receiving medical care. Additional information: Heart patient died after soldiers and security guards at the Separation Barrier gate refused to let her cross to go to hospital in Jenin. 18 year-old, died on 29.06.2007 at the checkpoint in the area of Bethlehem, following a delay in receiving medical care. Additional information: Seriously wounded in traffic accident, he died after Border Police at the tunnels checkpoint refused to let him enter Jerusalem so he could be taken to the hospital there. 23 year-old resident of Gaza city, died on 23.05.2007 at the checkpoint in the area of Erez (Industrial Zone), North Gaza district, following a delay in receiving medical care. Additional information: Was seriously injured during clashes between Fatah and Hamas on 15/05/2007. Died from his wounds after Israel delayed his transportation to a hospital in its territories even though he had a permit to pass. 20 year-old resident of ‘Azzun, Qalqiliya district, died on 17.02.2007 at the Separation Barrier gate in the area of ‘Azzun, Qalqiliya district, following a delay in receiving medical care. Additional information: Was severely injured when a tractor he and some friends were on turned over. He was taken by car to a gate of the separation barrier, where soldiers delayed them from crossing for twenty minutes. He was pronounced dead on arrival at the hospital. 46 year-old resident of ‘Ein Beit al-Maa R.C., Nablus district, died on 18.01.2007 at the checkpoint in the area of Huwara, Nablus district, following a delay in receiving medical care. Additional information: Cancer patient who was on his way home from treatment at a hospital in Jerusalem. He died after soldiers did not let him cross the checkpoint in a vehicle, on grounds that he only had a permit to cross by foot. He waited two hours until a car with a permit came and he was allowed to cross. 44 year-old resident of Tell, Nablus district, died on 12.12.2006 at the checkpoint in the area of Tell, Nablus district, following a delay in receiving medical care. Additional information: Died of a heart attack after being delayed at a flying checkpoint on his way to the hospital and having to take dirt roads, which greatly lengthened his journey. Under 1 year-old resident of Nablus, died on 12.11.2006 at the checkpoint in the area of al-Badhan, Nablus district, following a delay in receiving medical care. Additional information: Week-old infant on his way to hospital in Nablus for treatment. The driver of the car was beaten by soldiers at the checkpoint when he went over to them to explain the infant’s grave medical condition. 81 year-old resident of ‘Askar R.C., Nablus district, injured on 06.12.2002 in ‘Askar R.C., Nablus district, following a delay in receiving medical care, and died on 15.08.2006. Additional information: Suffered a heart attack during an IDF operation to arrest wanted persons. The soldiers delayed the ambulance and prevented her evacuation by members of her family. When finally evacuated, she died on the way to the hospital. 65 year-old resident of Beit Furik, Nablus district, died on 13.07.2004 at the checkpoint in the area of Beit Furik, Nablus district, following a delay in receiving medical care. Additional information: He was delayed at the checkpoint for an hour, during which he suffered chest pains. Under 1 year-old resident of Salem, Nablus district, died on 28.08.2003 at the checkpoint in the area of Beit Furik, Nablus district, following a delay in receiving medical care. Additional information: The mother was delayed at a checkpoint when she was giving birth, and was forced to deliver behind the concrete blocks at the checkpoint. The newborn died a few minutes later. 52 year-old resident of Balata R.C., Nablus district, died on 24.02.2003 in Balata R.C., Nablus district, following a delay in receiving medical care. Additional information: He suffered a heart attack during an IDF search of his house. Soldiers delayed the ambulance evacuating him to hospital by half an hour. 57 year-old resident of a-Nabi Saleh, Ramallah and al-Bira district, died on 29.12.2002 next to Ramallah, following a delay in receiving medical care. Additional information: He was taken by private vehicle to the hospital after suffering a heart attack. On the way, the vehicle was delayed by a settler and soldiers, and the driver traveled along dirt roads, bypassing most of the checkpoints and settler roads. He died as a result . 47 year-old resident of ‘Azmut, Nablus district, died on 08.12.2002 in ‘Azmut, Nablus district, following a delay in receiving medical care. Additional information: He was sick and unable to to get to the ambulance on the other side of a trench that had been dug at the entrance to the village. Under 1 year-old resident of Hebron, died on 23.09.2002 in Hebron, following a delay in receiving medical care. Additional information: A curfew on the city prevented the infant from reaching the hospital, and he was pronounced dead on arrival. 57 year-old resident of Bir Zeit, Ramallah and al-Bira district, died on 18.06.2002 at the checkpoint in the area of Surda, Ramallah and al-Bira district, following a delay in receiving medical care. Additional information: Fall and suffered from chest pains. He was delayed on his way to hospital in Ramallah; soldiers at the checkpoints did not allow the ambulance to reach him . 55 year-old resident of Rafah, died on 29.05.2002 next to Khan Yunis, following a delay in receiving medical care. Additional information: The ambulance taking her to the hospital was delayed several times, and she died on the way. Under 1 year-old resident of Nahhalin, Bethlehem district, died on 25.05.2002 at the checkpoint in the area of Bethlehem, following a delay in receiving medical care. Additional information: Physical roadblocks on the way from the village to Bethlehem prevented his mother, who was in labor with him, from reaching the hospital. She was forced to give birth in a car with help from a member of the ambulance team summoned to meet her. The newborn infant died on the way to the hospital. 21 year-old resident of Qibya, Ramallah and al-Bira district, died on 22.05.2002 at the checkpoint in the area of Deir Abu Ibzi’, Ramallah and al-Bira district, following a delay in receiving medical care. Additional information: A kidney patient, she was on her way to dialysis treatment. Soldiers at the checkpoint twice refused to let her cross; the second time, they fired a tear-gas canister at the car she was in. She died in the car. Under 1 year-old resident of Salem, Nablus district, died on 18.04.2002 in Nablus, following a delay in receiving medical care. Additional information: The infant was born at home because it was impossible to reach the hospital. Her medical condition deteriorated three days after birth. The ambulance called to the house was delayed several hours on the way, and the infant died at home. 2 year-old resident of Deir al-Hatab, Nablus district, died on 17.04.2002 in Nablus, following a delay in receiving medical care. Additional information: Because Nablus and nearby villages were under curfew, she could not be taken to the hospital, which led to her death there. Under 1 year-old resident of Nablus, died on 12.04.2002 in Nablus, following a delay in receiving medical care. Additional information: He was born prematurely at home, the IDF having prevented his mother from reaching the hospital, and died due to lack of medical treatment. 68 year-old resident of Bethlehem, died on 09.04.2002 in Bethlehem, following a delay in receiving medical care. Additional information: A cancer patient who died at her home after the IDF prevented the Red Crescent from reaching her to provide her with medicine or take her to the hospital. 80 year-old resident of Bethlehem, died on 09.04.2002 in Bethlehem, following a delay in receiving medical care. Additional information: On April 3, 2002, he had a stroke, but due to the ongoing fighting in Bethlehem, he couldn’t be taken to the hospital by ambulance or private vehicle. Several days later, he died at home. 37 year-old resident of Nahhalin, Bethlehem district, died on 04.04.2002 at the checkpoint in the area of Bethlehem, following a delay in receiving medical care. Additional information: A kidney patient, she was delayed on her way to the hospital in Jerusalem and died shortly afterwards. 17 year-old resident of Kur, Tulkarm district, died on 09.03.2002 at the checkpoint in the area of Qalqiliya, following a delay in receiving medical care. Additional information: IDF soldiers refused to let the woman cross the checkpoint at the entrance to Qalqiliya after she had given birth to a stillborn child in ‘Azzun. She ultimately reached the hospital, where she was pronounced dead on arrivall. Under 1 year-old resident of Beit Furik, Nablus district, died on 26.02.2002 at the checkpoint in the area of Beit Furik, Nablus district, following a delay in receiving medical care. Additional information: He was stillborn at birth after his mother, in labor, had to travel four hours to reach the nearby hospital after being denied passage at a checkpoint. 46 year-old resident of Tulkarm R.C., died on 23.01.2002 at the checkpoint in the area of Deir Sharaf, Nablus district, following a delay in receiving medical care. Additional information: The ambulance in which he was being transferred to the hospital in Tulkarem from the hospital in Nablus was delayed for several hours at the checkpoint. 48 year-old resident of ‘Asira al-Qibliya, Nablus district, died on 21.12.2001 at the checkpoint in the area of Huwara, Nablus district, following a delay in receiving medical care. Additional information: A heart patient who was denied passage at the Hawarra checkpoint on her way to the hospital in Nablus. She then had to go via the Awarta checkpoint which extended the trip and as a result caused her death. Resident of al-Yamun, Jenin district, died on 11.12.2001 at the checkpoint in the area of Jenin, following a delay in receiving medical care. Additional information: The mother was delayed at the entrance to Jenin. When she gave birth, her baby died due to a lack of oxygen. 50 year-old resident of Ramin, Tulkarm district, died on 13.11.2001 at the checkpoint in the area of Nablus, following a delay in receiving medical care. Additional information: A kidney patient , he was not allowed to cross the checkpoint near the Qedumim settlement on his way to receive dialysis treatment at the Nablus hospital. Under 1 year-old resident of al-Walajah, Bethlehem district, died on 22.10.2001 at the checkpoint in the area of al-Walajah, Bethlehem district, following a delay in receiving medical care. Additional information: The child died shortly after birth, following delay of his mother at a checkpoint. 40 year-old resident of a-Ras, Tulkarm district, died on 16.10.2001 at a checkpoint near Tulkarm, following a delay in receiving medical care. Additional information: A kidney patient who required dialysis treatment three times a week, he was delayed at a checkpoint on his way to hospital in Tulkarem. He died in Tulkarem while walking to the hospital. Resident of ‘Urif, Nablus district, died on 23.09.2001 at the checkpoint in the area of ‘Urif, Nablus district, following a delay in receiving medical care. Additional information: Was stillborn at birth after the mother, Amana Safdi, who was nine-months pregnant, was delayed at a checkpoint for five hours. 2 year-old resident of a-Tarem, Jenin district, died on 23.08.2001 at the checkpoint in the area of Ya’bad, Jenin district, following a delay in receiving medical care. Additional information: He was delayed at a checkpoint and died when he reached the clinic in Yabed. 61 year-old resident of a-Nabi Saleh, Ramallah and al-Bira district, died on 02.07.2001 next to Ramallah, following a delay in receiving medical care. Additional information: She died after being delayed at a number of checkpoints on her way to the hospital in Ramallah. 11 year-old resident of a-Sawiya, Nablus district, died on 23.03.2001 at the checkpoint in the area of Huwara, Nablus district, following a delay in receiving medical care. Additional information: She suffered from a congenital brain deformity and lost consciousness. She was delayed at the Hawarra checkpoint for about an hour, and died on the way to the hospital after the car she was in was allowed to pass. 48 year-old resident of Faqqu’a, Jenin district, died on 14.03.2001 at the checkpoint in the area of Jenin, following a delay in receiving medical care. Additional information: A diabetes patient, she was delayed for four hours at the checkpoint. 39 year-old resident of ‘Aqraba, Nablus district, died on 13.03.2001 at the checkpoint in the area of Huwara, Nablus district, following a delay in receiving medical care. Additional information: Delayed at the Hawarra checkpoint for more than an hour, the vehicle carrying him had to take dirt roads to reach the hospital in Nablus. 45 year-old resident of Beit Furik, Nablus district, died on 25.02.2001 in Nablus, following a delay in receiving medical care. Additional information: She died from loss of blood after being stopped at several IDF checkpoints while on her way to the hospital in Nablus, and being forced to take dirt roads. 66 year-old resident of Beit Lid, Tulkarm district, died on 16.02.2001 at the checkpoint in the area of Tulkarm, following a delay in receiving medical care. Additional information: Suffered of chest pains. He died after being delayed for more than an hour at the checkpoint at the entrance to Tulkarem. 65 year-old resident of Kafr Qadum, Qalqiliya district, died on 06.02.2001 at the checkpoint in the area of Nablus, following a delay in receiving medical care. 66 year-old, died on 27.01.2001 at the checkpoint in the area of Huwara, Nablus district, following a delay in receiving medical care. Additional information: Although suffering from shortness of breath, she was delayed for 15 minutes at the Hawarra checkpoint, then was taken via the back roads and died on the way to the hospital. 30 year-old resident of al-Janiya, Ramallah and al-Bira district, died on 23.01.2001 at the checkpoint in the area of Dolev, Ramallah and al-Bira district, following a delay in receiving medical care. Under 1 year-old resident of Beit Dajan, Nablus district, died on 07.01.2001 in Beit Dajan, Nablus district, following a delay in receiving medical care. Additional information: She died at birth at home after the IDF prevented her mother from leaving the village to go to the hospital. 40 year-old resident of Rantis, Ramallah and al-Bira district, died on 05.01.2001 next to Rantis, Ramallah and al-Bira district, following a delay in receiving medical care. Additional information: He suffered a stroke and died en route to hospital in Shuqba along back roads. 60 year-old resident of Nablus, died on 16.12.2000 at the checkpoint in the area of Nablus, following a delay in receiving medical care. 37 year-old resident of a-Zawiya, Salfit district, died on 16.10.2000 near the checkpoint in the area of a-Zawiya, Salfit district, following a delay in receiving medical care. Additional information: He had kidney disease, and was unable to reach the hospital in Nablus to receive dialysis treatment. 10 year-old resident of a-Sawiya, Nablus district, died on 14.10.2000 at the checkpoint in the area of Nablus, following a delay in receiving medical care. Additional information: She suffered stomach pains and was not allowed to cross the checkpoint with her father and get to the hospital in Nablus. It is over. The entire affairs has been resolved. Zionist New York Times–no less–orders Najib Miqati to arrest the four accused Hizbullah members at once. As is known, New York Times orders are quickly implemented in the Middle East. But this arrogance of the paper has to be interrogated: imagine if a Lebanese newspaper writes an editorial ordering the US government to arrest some four Americans. This mentality is purely colonialist: the New York Times figures that operating outside of a major city in the capitalist center gives it an international authority. How silly. The arrogance of American Zionists knows no bounds. An international tribunal has called on Lebanon’s government to arrest four suspects indicted in the 2005 car-bomb killing of former Prime Minister Rafik Hariri and 21 others. All four of the accused are members of Hezbollah, the militant Shiite movement whose cynical mix of politics and armed intimidation helped bring Prime Minister Najib Mikati to power. Hezbollah’s leader, Hassan Nasrallah, vows the four will never be turned over for trial. Mr. Mikati has a legal duty to arrest them. He claims to be politically independent of Hezbollah. This is the perfect chance to prove it. Carrying out these arrests will require extraordinary political courage. Failure to do so would cost Lebanon dearly, threatening its civil peace and leaving no doubt that the real powers in Lebanon are Hezbollah and its backers in Syria. The reverberations of Mr. Hariri’s murder have rocked Lebanon for the past six years, threatening its recovery from the disastrous 1975-1990 civil war. Mr. Hariri was a symbol of that recovery. Popular fury over his killing helped force out Syrian occupation troops. But the failure to bring his killers to justice has revived the bitter mistrust among Lebanon’s main confessional groups — Sunnis, Shiites, Christians and Druse — opening the way for Hezbollah’s alarming rise. Other countries have important roles to play in urging Mr. Mikati to turn over the indicted suspects. That goes especially for members of the United Nations Security Council, whose authority stands behind the international tribunal. The United States, the European Union and Russia have issued helpful statements. Saudi Arabia and Egypt have spoken less emphatically. All need to raise their voices in the weeks ahead. Lebanon has until early August to arrest the four men. If it does not, the international tribunal has the authority to try them in absentia. If convicted, they would become international outlaws, subject to future arrest and punishment. Any Lebanese government that continued to shelter them could be subjected to international sanctions, including suspensions of economic assistance. Lebanon should do its duty now, and arrest the four indicted suspects and turn them over to the tribunal. IsraHell has passed an anti-boycott law. It’s yet another example of IsraHell jettisoning its democratic facade but apparently it’s to protect the economy of the settlements. the Boycott Law is only ostensibly about boycotts of goods produced in the settlements, just as the Admissions Committee Law is only ostensibly about community life in small towns and the Nakba Law is only ostensibly about commemorating the Palestinians’ “catastrophe,” and so on and so forth ad infinitum. All of these new laws, all the new conditions stating that “anyone who doesn’t recognize the Jewish and democratic state” will not receive state funds or will lose his citizenship or will not be allowed to sleep in the afternoons, have one purpose only: to completely eradicate open political debate and to comprehensively delegitimize everyone who doesn’t think like MKs Zeev Elkin, David Rotem, Michael Ben-Ari and their friends. The question that most preoccupied Meridor yesterday related to how Israel would be perceived by the international Quartet. He was genuinely worried that the law to punish those who boycott the settlements would not paint Israel’s parliament in a terribly flattering light. But Israel’s image is a truly trivial issue compared to the process of change being wrought in Israeli society by the cabal of Yisrael Beiteinu, extremist rabbis and Kahanists. This process is crudely erasing entire entries from the democratic dictionary, and in their place – via a series of focused laws with intentionally vague wording – it is putting blatantly totalitarian values. The Boycott Law is just one step in this process. Anyone who attempts to relate substantively of any of these separatist laws – all of which are meant to “defend” Israel from a long list of imaginary monstrous enemies – or who chooses to ignore their overall anti-democratic context is guilty of naivete at best, and perhaps even of dangerously feigning innocence. Magnes Zionist has an interesting take on the new law here. He thinks it’s unworkable. I don’t know if it is or it isn’t. I do find it remarkable though that so many people in the west who claim to support Israel because it’s “the only democracy in the middle east” don’t say a word when the trappings of democracy are being steadily undermined by the Israeli government. No one would describe the EUMC working definition as a state-of-the-art exposition of the characteristics of anti-Jewish prejudice in all its forms. It adds that “such manifestations could also target the state of Israel, conceived as a Jewish collectivity”. It explains that denying “the Jewish people” the right to self-determination – for example, by proclaiming that Israel is “a racist endeavour”- could be regarded as antisemitism, as could holding Jews collectively responsible for the actions of the state of Israel. But it also says that “criticism of Israel similar to that levelled at any other country cannot be regarded as antisemitic”. And we might also note that, within the working definition’s more general list of actions and activities that could be regarded as antisemitic are: calling for the killing of Jews in the name of an “extremist” religion; making “mendacious” claims about Jews – such as the myth of a Jewish world conspiracy; and accusing Jews “as a people” of “inventing or exaggerating the Holocaust”. Such, in outline, are the broad characteristics of the working definition. At its recent conference, the UCU resolved that it would henceforth make “no use” of the definition – which must and can only mean no use whatever. And that, “in any public discussion on the matter”, it would “dissociate itself” from the definition – which can only and must mean that it would and will publicly repudiate the content of that definition: the content, the whole content and nothing but the content. For the wording of the UCU’s resolution contains no reservation. The brothers and sisters of the UCU – or rather, to be fair, of the UCU conference delegations – rejected the definition in its entirety. What has happened here is that, typically, Israel advocates have listed out some things which are truly antisemitic, some things which are not and some things which “taking into account overall context, could be” antisemitic. Among the things that are not of themselves antisemitic are comparing Israel to the nazis and “denying the Jewish people their right to self-determination”. Some Israel advocates say that this could be antisemitic in certain contexts like say walking into a synagogue and shouting “you have no right to self-determination” at the congregation but since that could apply equally to throwing a bunch of daffodils into a synagogue congregation it shouldn’t really be included in a working definition of antisemitism lest some idiots come away with the idea that it is antisemitic to to say that the ethnic cleansing and colonial settlement policies required to implement self-determination for the Jewish people is not very nice. Clearly, contrary to what Alderman is saying, the UCU recognises that there is such a thing as antisemitism. They just reject the confusion of criticism of the State of Israel with the real thing. If they didn’t recognise the real thing as existing then why did they mention it in their resolution? Maybe more to the point, why didn’t Geoffrey Alderman mention that they mentioned it in their resolution? What the UCU is doing is what should always be done with a curate’s egg and that is rejecting the whole shebang whilst recognising that it may well be good in parts but the rotten parts render the whole thing rotten. I guess that the picture is clearer than ever– Israel doesn’t stand a chance. Its fate is doomed. It is just a question of time. It is not a matter of ‘if’ but a question of ‘when’. But the truth of the matter goes slightly deeper. Both the Flotilla and the Flytilla are exemplary cases of ‘civil society campaigns’– they were intended to mobilise international public support using peaceful and democratic means. Both campaigns were not aimed to harm Israel’s security in any way; rather, they were there to draw the world’s attention to the situation in Gaza and the West Bank. Their immediate goal i.e. reaching Palestine, was not fulfilled, but their mission is still a clear and significant victory because it proves once again what Israel is all about: the Jewish State is a closed society, a morbid collective driven by ‘Pre-Traumatic Stress Disorder’ (fuelled by vivid imaginary fantasies of destruction). Most importantly, the Israeli government’s desperate measures against the peaceful Flytilla proved to the world that the West Bank is also under siege, and Palestine is closed to visitors. The leaders of the two ‘civil society campaigns’ had done their homework: they had planned it all for months, orchestrating and coordinating an airlift of different international groups. They had raised the funds, and they operated as you would expect ‘civil society campaigners’ to operate. But they had failed to see one thing. They did not grasp the most obvious fact about the Jewish State and its supportive powers around the world. As much as they wanted to put into action the most civilised peaceful strategy, they may have failed to grasp that the Jewish State is not a civilised place, and it is also totally foreign to the notion of civilisation. Once again the Israeli Government provided its critics around the world with a clear lesson about the unique traits of the Jewish State. The word ‘civilisation’ comes originally from the Latin word civilis, related to the Latin words civis, meaning citizen, and civitas, meaning city or city-state. ‘Civilisation’, then, is traditionally grasped as a society that acknowledges and respects notions of ‘civil law’ and ‘citizenship’. Israel is not such a society unfortunately. Most of the people whose homes are on Israeli-controlled land lack basic civil rights just for failing to be Jewish. It is possible that Israel’s deficiency in that regard is rooted in orthodox Judaism’s defiance of the notions of ‘civil law’ and civilisation. For Rabbinical Judaism, it is the Halacha law that strictly sets the legal rights and duties of the Jew. The outcome of this struggle is clear: by now, Israel has very little respect for the notion of ‘civilisation’ or ‘civil law’. At the most, it mimics some liberal Western symptoms. The Arab MK Azmi Bisharawho suggested a few years ago that Israel should become a state of all its citizens ( i.e. a civilisation ), had to run away for his life, and has lived in exile ever since. It is not a secret that Israeli Arabs (Palestinians with Israeli citizenship) are second class citizens, and the Palestinians in Gaza and the West Bank lack any meaningful civil status. They are dwelling in open air prisons. They are subject to Israeli brutality and different forms of racially discriminative laws. Not only that, foreign labour communities in Israel are also totally marginalised, living a life of complete insecurity, with few rights. The obvious question here then, is whether ‘civil society action’, as we have seen in recent weeks from international solidarity activists, can have any effect at all on a society that so clearly defies the notions of ‘civil law ‘and ‘civilisation’? Israel itself is obviously just part of the problem: the Jewish State is supported by some relentless Jewish Lobbies all over the world. These lobbies do manage to push Western governments and political institutions into some very dark corners. In Britain, for instance, Sheikh Raed Salah, AKA the ‘Gandhi of Palestine’ has been detained for more than a week following the shameful British Government surrender to right-wing Jewish Lobby pressure. Also, the Israeli press was proud to report recently about the incentives offered by Jewish organisations to the struggling Greek government ahead of the Flotilla. The Israeli Government and its supporting lobbies gathered a while back that it is much cheaper to buy a Western politician than it is to buy a tank. So, the moral for the rest of us should be clear: though Israel itself defies the notion of civilisation, the above incidents prove that its lobbies around the world still manage to interfere with our respective nations’ civilisations. Palestinian Solidarity leaders will have to draw the necessary lessons from the recent events. Civil Society Campaigns do mobilise public support around the world and this is indeed very important. However, such campaigns may be just too weak to bring about a change of consciousness in Israel. In order to defeat Israel and Zionism, we must first admit to ourselves what Israel is all about: we are combating a unique, racially oriented, expansionist tribal project that has no precedent in history, and this project exceeds beyond its natural geographical boundaries. Israel is not just a territorial quest; it is actually an ideology, and its modus operandi is driven by radical forms of racial supremacy (Jewish chosen-ness). But we should also acknowledge that the Jewish State is not alone: it is supported institutionally by world Jewry. If we care about Palestine, world peace and the state of our world in general, our task is to stand up openly and identify the kinds of ideology, politics and culture that serve the Jewish State and its interests, both globally and locally. We do not necessarily have to travel to Palestine to combat the Israeli soldiers: it may be better to locate its mercenaries around us, in our media, political institutions, think tanks, academia and economy. These people and organisations actually interfere with our civilisation, with our most sacred Western values of ethics, pluralism, harmony and tolerance. Those activists that did make it to Israel were very quickly detained and given deportation orders. It may be argued that Islam also defies the notion of Civil Law. However, unlike Judaism, Islam is a universal precept. It clearly defined respectful measures and approaches towards ethnic and religious minorities. Surely she was overreacting. After all, how much damage could one pathetic little furball really do? As it turns out, a lot. 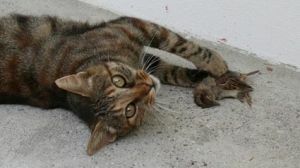 Any cat owner who’s ever found a mouse corpse thoughtfully placed on her pillow knows that cats are efficient hunters. Domestic cats, officially considered an invasive species, kill at least a hundred million birds in the US every year—dwarfing the number killed by wind turbines. (See “Apocalypse Meow,” below.) They’re also responsible for at least 33 avian extinctions worldwide. A recent Smithsonian Institution study found that cats caused 79 percent of deaths of juvenile catbirds in the suburbs of Washington, DC. Bad news, since birds are key to protecting ecosystems from the stresses of climate change—a 2010 studyfound that they save plants from marauding insects that proliferate as the world warms. Considering all this—and the fact that the US feline population has tripled over the last four decades, to about 600 million in 2007—it’s clear we have a kitten problem. Cat advocacy groups believe they’ve found a simple solution: Trap ferals, sterilize them, then release them. Posted in HealthComments Off on Are Cats Bad for the Environment?